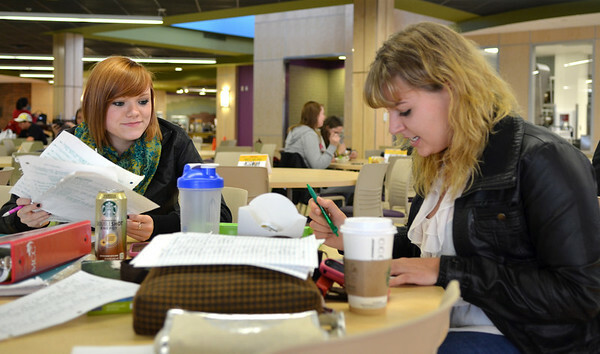 Monica Maschak - mmaschak@shawmedia.com Maddie Petri (left), 19, of Crystal Lake, and Lexi Chancellor, 19, of McHenry, study for a biology exam in the newly remodeled cafeteria at the McHenry County College Tuesday, October 30, 2012. Renovations to MCC Building B includes a new cafeteria, a kitchen for the culinary students and a new student-run restaurant. Monica Maschak - mmaschak@shawmedia.com Culinary students Keith Goodman (left) and Chris Arnesen prepare a vegetarian potsticker meal for an event the same evening to unveil the recent renovations at the McHenry County College's Building B on Tuesday, October 30, 2012. The building's new interior was reopened last week after being under construction since May of this year. 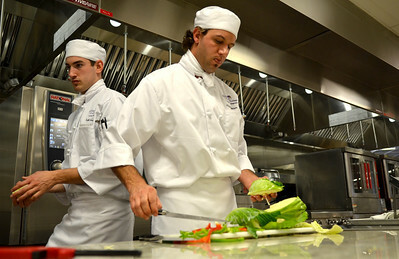 Culinary students Keith Goodman (left) and Chris Arnesen prepare a vegetarian potsticker meal for an event the same evening to unveil the recent renovations at the McHenry County College's Building B on Tuesday, October 30, 2012. The building's new interior was reopened last week after being under construction since May of this year.